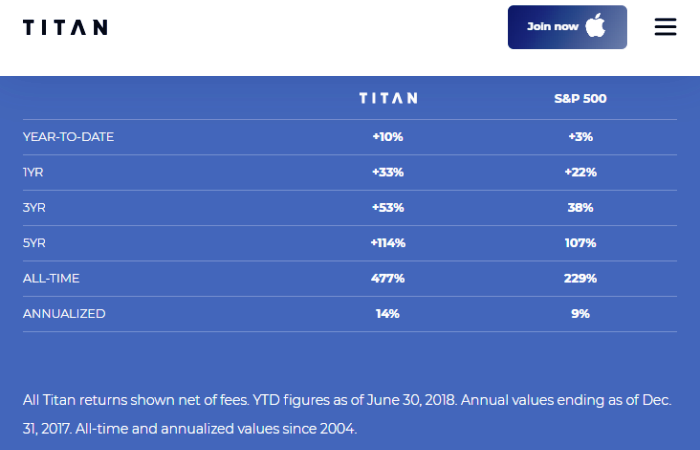 Titan Invest is a new SEC Registered Investment Adviser that opened in 2018. They are owned by Whisker Technologies, Inc., and officially located at: 524 Broadway, 11th floor, New York, NY 10012. Contact phone number is (908) 500-0207. Customer support email address is: support@titanvest.com. Official Website: https://www.titanvest.com/. Investors at Titan Invest are given access to their easy to use trading platforms, which are mobile apps for Android & iOS. This company is built as a hedge fund for the average millennial investor. Managed by a group of former hedge fund executives, Titan was created to simplify investing for everyone. Their investment algorithm buys a portfolio of the “Top 20 Stocks” owned by hedge funds with high long term performance. During 2017 the fund produced outstanding returns of 33% in comparison to the S&P 500 return of 22%. The minimum deposit for an investment account is $1,000. This broker charges an advisory fee of 1%, based on your account size. So if you have a $10,000 account, your annual fee will be $100. Scam Broker Investigator reviews hundreds of online brokers to see if they are legitimate brokerage firms, with a license. The best way for you to know if your Stock / Options broker is not a scam, is by checking their regulatory status. 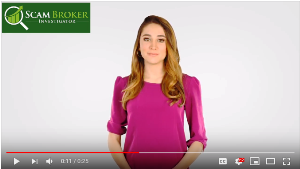 When you see that the broker is regulated by FINRA, and a member of SIPC, you can be sure that they are a legitimate broker. Titan Invest is a legal RIA, that works with Third Party Trade LLC, which is a member of FINRA and SIPC. You can see their license number 67630, look here. When investing with a firm that is a member of the Securities Investor Protection Corporation (“SIPC”), investors accounts are protected for up to $500,000. You have many brokers to compare and choose from online. The reason smart investors choose to use a regulated broker instead of a scam broker, is because they are interested in trading, and not worrying about a broker processing their withdrawal. Bitcoin and Crypto Currency investing has increased in popularity, which has brought with it many new scams targeting Americans. Make sure you always verify that the broker you are investing with is licensed and regulated! Forex.com is a popular Forex and Futures broker that is registered with the CFTC and a member of NFA, see here. They offer a robust web trader platform, along with MetaTrader4 trading software, read more.